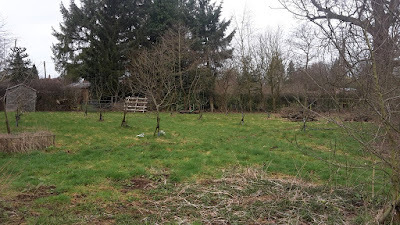 Last week, whilst the boy took a long nap I managed to get down into the orchard to prune some of my trees. They're really putting on some growth now so it's important that they grow how I want them to, to make fruit ripen and to make picking easy! The first job before tackling any tree to look for diseased or damaged wood and remove it. Even if the branch is int he right place if it has canker then it's not going to grow strong. I was pleasantly surprised that there wasn't much canker and I only had to cut out a couple of branches with it. Unfortunately this did make one tree really lob sided but another branch will grow to fill the void in time. 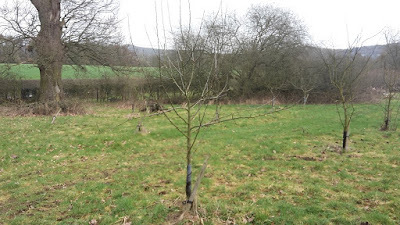 I then set about each tree in turn, standing back and taking a look at it from all sides. I want my trees to be goblet shaped, clear of branches in the middle with branches not any higher than my head. I try not too take too many branches off in one year, no more than a quarter, I tend to remove the middle upright ones first and then look again at the tree, picking branches to form a frame work. 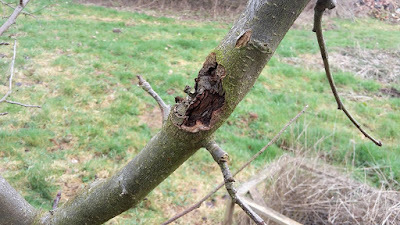 Quite often I'll leave branches on that I can see have lots of fruit buds on, to remove a following year, I want a good frame work but I also want some fruit! 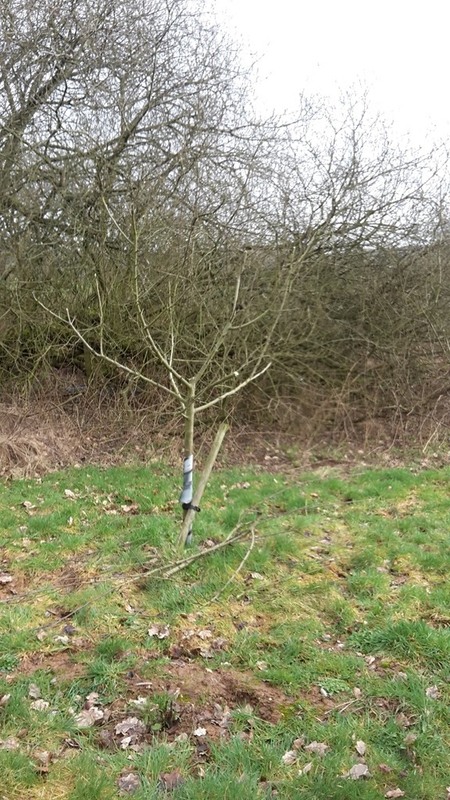 You'll soon develop a keen eye for spotting the difference between fruit buds and leaf buds, it also pays to be careful as you remove branches not to knock fruit buds off from elsewhere on the tree. Remember you're shaping the tree but it still needs to be productive. When pruning trees it's important to remember that not everything has to be done that year, if you take too much off you'll encourage the tree to put on lots of woody growth at the expense of your fruit. Pruning fruit trees is an on going project that takes years, there's no rush! I've included a few before and after pictures of trees that I did and these are by no means perfect, but they are starting to form the frame work I want. 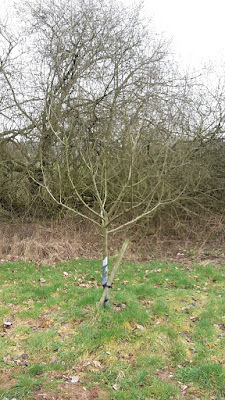 Some of the lower branches on the first tree are being left as a temporary measure to give me more fruit now and gradually I'll lift the canopy to the height I want as branches form in the right place, the second tree has the goblet shape formed now but still too much upright growth that needs to be removed in coming years. I know that fruit tree pruning is a daunting prospect for some so I hope this post helps, remember that you're better to have a go than not and trees soon grow branches again! Who else has been pruning fruit trees this winter? Been pruning today. Some trees are over twenty years old and looking pretty ropey as we haven't paid enough attention to them. Some brutal pruning going on, consequently a few look as though they have been massacred rather than pruned. Yours are looking in pretty good shape. They always grow branches back though. Just so long as you don't take too much off in one year or they can go a bit crazy with water shoots growing up everywhere. Trying. Have several that have been neglected. Lost a tropical peach earlier this year. Have lots of mangoes (all varieties) really bountiful. Have started 4 elderberry from cuttings ( for medical use),and pruned 2 old pear trees. Also planted several Mulberries from cuttings--makes great jam. Pruned and shaped a Key lime last year and its looking good. Last year had a bumper crop of Avocadoes where neighbors fertilizer runs onto our property, I started tree from seed. Have had bunches and bunches of bananas and Plantains. Wish I could share some of our tropical fruit. Most of our property is too wet and tap roots rot. Fighting citrus canker and no cold snaps to sweeten citrus but blessed in so many ways. Me! I do much the same as you. I try to form a goblet shape.... not always successfully. I still have a few of the bigger trees to prune. Yeah, mine don't look like it yet, they're gettign there though! I'm sure you do well at it! I currently only have one apple tree which I think I pruned/tidied up a couple of weeks ago!!! So long as it's had some branches removed that's the main thing, nothing worse than a tree that's had nothing done to it for years! I've done mine. Good advice and guidance here Kev. Is it like oranges where it needs some cold to turn to orange from green - that's why you get green oranges in the tropics! 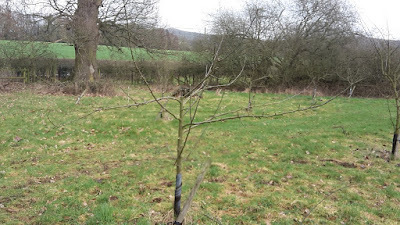 I went on quite a few courses years ago to learn to prune fruit trees and then I've done loads of them since them to keep the knowledge there! I'd really recommend a course as a good way to learn (the ones I did was at pershore college).